Kate Iltis from EmDash gave me a ring a few months ago and asked me to make an illustration for an essay in the Texas Observer. I had a great time working on it and thought it would be nice to write a post about the entire process. You can read the full essay here. It's a wonderful story about an unlikely relationship between a mother from El Paso and another mother, Perla, from the dangerous Ciudad Juárez. Perla crosses the border to make money for her family by selling avocados, limes, and guavas to Americans. She befriends the narrator of the essay and the two women become extremely close despite their different backgrounds. Eventually they lose touch and after 20 years or so they reencounter one another. The essay describes this meeting. The narrator learns how different Perla's life has been than her own. Perla's children, the ones the narrator use to bath in her own home, are all grown up and unfortunately apart of very violent lifestyles. Regardless of their differences the two women are very supportive of one another. I created two concepts for the illustration for Kate and the Texas Observer team to choose from. Image of fossils mingled with bullet casings in the foreground, El Paso/Ciudad Juárez landscape in the background. One of Perla's children, a seventeen year old extortionist, shows the narrator his collection of fossils. He doesn't understand what they are and when the narrator explains, he is baffled at the idea that they were once sea creatures. Just as the origin of the fossils is unexpected so is the relationship between the narrator and Perla. Image of a female blue bird protecting her nest. Her young are blue, sleeping snakes. The narrator may be from the other side of the border, but she still cares deeply for Perla and her children even though they lead a more violent life. Kate and the team at the Texas Observer choose the 2nd concept, the image of the bird protecting a nest of snakes. Below are shots of process for making the final piece. I use the initial sketch for reference and redraw it out larger. This stage of the process is the most important. It is where I make all of the decisions on how everything is going to layout. 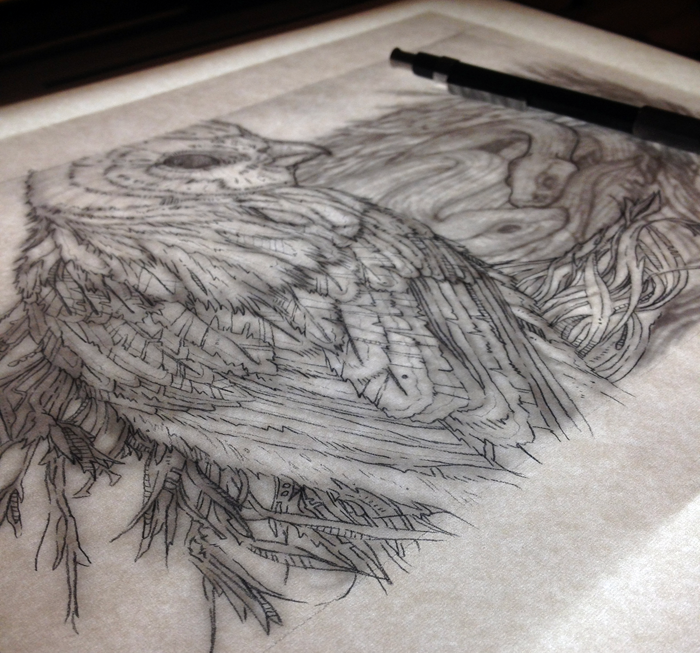 After I complete that drawing I transfer it with a light box on to the final watercolor paper. Next step is to paint! This is the most relaxing part of the process. At this point, most of the major decisions have been made and I get to watercolor away. By the time the piece is complete, I've drawn it 3 times: the first sketch, the larger drawing, and the transfer to the final paper. The next set of images are shots of the process. And here it is printed!